Crous Detection of Deception Services focuses on delivering superb truth verification examinations by using only the best approved and available technology. We make use of a Digital Voice Stress Analysis (VSA) system with qualified examiners to conduct truth verification tests. 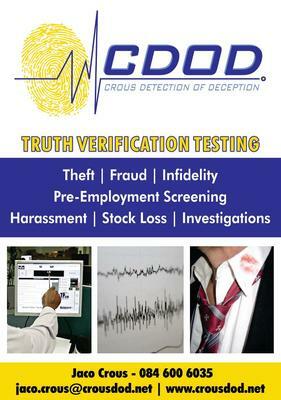 We provide expert Truth Verification Testing to all corporate firms, small businesses, law enforcement, attorneys and to the general public, all over the North West Province. We also conduct examinations throughout the Africa continent.